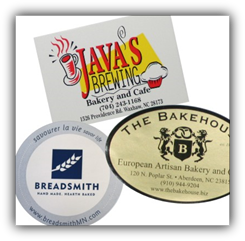 We offer a variety of stock label sizes allowing for a 3 color imprint. 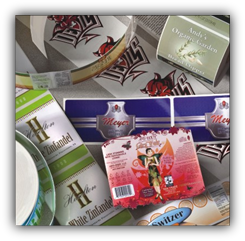 These labels are produced with flexographic printing and create a high quality look and feel with different label stocks: litho, semi-gloss, high gloss, and radiant foils. Digital printing eliminates the need for plates and our laser cutting system provides a tool-free method for cutting any desired shape. Without plate and tooling charges, you’ll be able to order small quantities at economical prices-create multiple versions of a product label for marketing research, or decrease your inventory with smaller label runs.